This post was originally published on BlogHer in December 2009. When it’s time to take out the Christmas decorations, our kids love digging out our dreidel collection to play with. Dreidels and Christmas? In our multi-cultural household, it is perfectly natural and normal. In our family, we don't officially practice any organized religion, but we do take the traditions that we were brought up with and incorporate them into family traditions. In December, we decorate our house for Christmas, set out cookies for Santa, light candles in a menorah for Chanukah and eat potato latkes. And we sing The Dreidel song and play the dreidel game. Everyone has seen the four-sided top, but what do those Hebrew symbols mean? Here’s a crash course. Each side of the driedel has a Hebrew letter – nun, gimel, hey or shin – on it. The letters stand for Nes Gadol Hayah Sham, which means “A Great Miracle Happened There”. The dreidel game is typically played with gelt, which are foil-wrapped chocolate coins. You can also use pennies, M&Ms or any other treat. To start, the gelt is split evenly amongst the players and each player puts one into a center pile. If Nun (נ) is facing up, you take nothing. If Gimel (ג) is facing up, you take the whole pile. If Hey (ה) is facing up, you take half the pile. If Shin (ש) is facing up, you put one piece into the pile. If the pile is empty, or has only one piece, each player puts one piece into the pile before the next spin. You play until one player wins everything. In case you think this is just a kid’s game, there is Major League Dreidel, where competitors compete for the longest spin. This year’s event is on December 9, 2010. 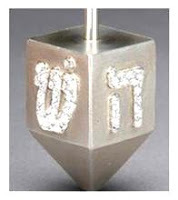 If you really want to go overboard, you can get this diamond-studded dreidel for $1800. From Tracing the Tribe: The Jewish Geneology Blog. If not, now you'll know how to play the dreidel game if you are given one from a Jewish friend. Hope you get Gimel! Happy Chanukah! 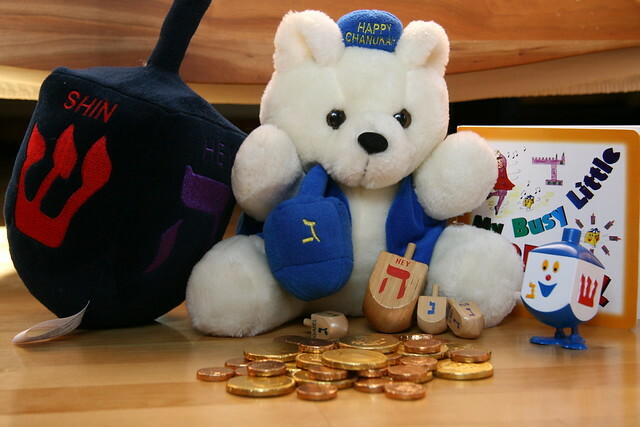 I never knew how to play Dreidel until I watched Elmo's Christmas...Baby Bear and Telly play the game. Here's a tidbit: In Israel, the fourth side (replacing the shin) is a Peh--so it stands for a great miracle happened HERE. My kids never liked the dreidel game. Way too easy to loose their shirts.